PORT ADELAIDE host reigning premiers North Adelaide at Alberton Oval in a huge Round 3 clash in the SANFL on Sunday afternoon. The Magpies have had a mixed start to the season, defeating West Adelaide in the season-opener before suffering a 36-point loss to South Adelaide in Round 2. Jack Trengove has been in scintillating form to start season 2019. The midfield gun has racked up 44 and 42 disposals in his first two games and has also laid a league-high 21 tackles. 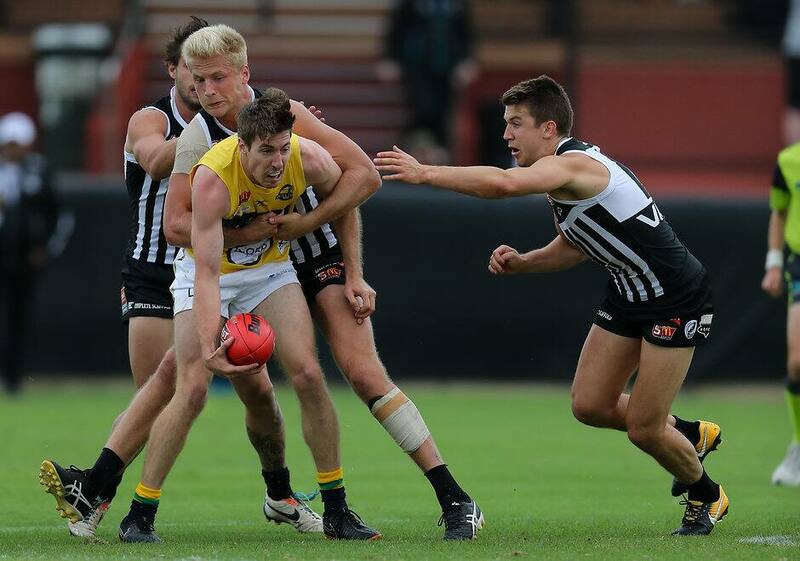 Former Lion Sam Mayes has also had a huge impact since arriving at Alberton in last year’s AFL trade period. The silky right-footer has averaged 30 touches a game and his disposal has been highly efficient. Matthew Broadbent has been a general in defence, while Trent McKenzie and Boyd Woodcock have each gathered plenty of the football and hit the scoreboard. Jarrod Lienert impressed in his first game back since injuring his knee against North Melbourne in JLT 2, and will be better for the run. The Roosters have also had a mixed start to the season, losing to the Eagles by 25 points in Round 1 before bouncing back against West Adelaide at Prospect Oval. Skipper Max Thring was very influential in his side’s 29-point victory over the Bloods with 30 touches and three goals, while key forward Mitchell Harvey (three goals) was pivotal up forward. Jarred Allmond, Brock Castree, Aidan Tropiano and Campbell Combe have all racked up good numbers across the first two games, and will be looking to continue that form against the Magpies on Sunday. Matthew Lokan says the Magpies will be coming up against a quality team this week but it’s important to focus on the style of play his side wants to deliver. “It’s important that we are consistent in bringing a four-quarter effort,” Lokan told portadelaidefc.com.au. Lokan has been excited by the form of the young players so far in 2019, especially some of the first-year boys. “Boyd Woodcock is an exciting prospect for us,” he said. “He’s come on in leaps and bounds over the last couple of weeks. It took him a little while to adjust but he is starting to play some really good footy. While the young talent has been exciting in parts, it’s been the senior boys who have brought the consistency according to the coach. “Trenners has been playing really well and found a heap of the footy,” he said. “He’s a fantastic leader for our group and he always leads by example. “Mayesy has been a great pick-up and has been extremely consistent for us across the start of the season. Sunday’s clash between Port and North at Alberton Oval commences at 2.10pm.